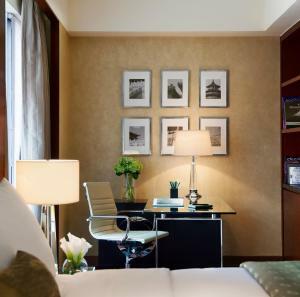 Strategically occupying a prime location in the heart of the bustling Wangfujing commercial area, The Imperial Mansion, Beijing - Marriott Executive Apartments is surrounded by popular shopping malls, souvenir shops and typical local restaurants. Offering a stylish indoor skylighted pool, this gorgeous property boasts luxuriously decorated guestrooms with balconies and oversized windows overlooking the vibrant city. Marriott Executive Apartments the Imperial Mansion is a 3-minute stroll to Wangfujing Subway Station (Line 1), from which Tian’anmen Square and the Forbidden City are both located one stop away. Beijing Railway Station is 10 minutes' drive from the property, while Beijing South Railway Station is 25 minutes' drive away. It takes 45 minutes by car to Beijing Capital International Airport. Each apartment comes with a flat-screen TV, an iPod docking station, a washing machine with dryer and a kitchen with all necessary facilities. 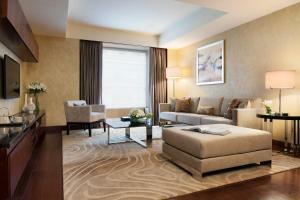 The large bed with feather pillows, dedicated living areas and marble bathrooms create an elegant atmosphere. Unwind and keep fit in the contemporary fitness centre, organise day trips at the tour desk, or rent a car to explore the surrounding areas are ideal options for the travellers to relax after a long journey or a busy day. 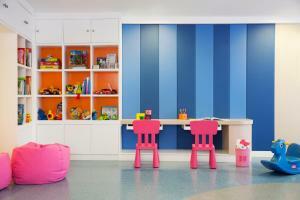 The on-site meeting room allows the guests to catch up with the last-minute work. To maximise the gourmet experience in Beijing, visiting Wangfujing Snack Street, located just a stone's throw away, is a nice choice. السعر: CNY 1080.00 ... CNY 2813.33; select dates below to get current rates. السعر: CNY 1267.50 ... CNY 2760.00; select dates below to get current rates.